Oil States offers replacement rubbers for various types/styles of tubing stripper heads. These rubbers are manufactured by Oil States utilizing a proven oil- and abrasion-resistant rubber compound developed by our Elastomer Technology Center. Tubing can be pulled or run in-hole through the rubber with pressure still on the well while also stripping fluids from the tubing O.D. to provide a cleaner job site. 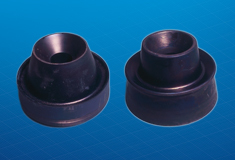 Replacement rubbers are offered for Larkin, Hall, Guiberson, BIW, Gulfco, Huber, Norris-Hinderliter, Petromec, OCT, PGSR, Rector and Marcom tubing stripper heads. Proven oil- and abrasion-resistant rubber compound. Replacement rubbers available for many brands.